I had the intention of restoring an old kayak that was gifted to me and then using it for fly fishing from. The weather hasn't been too kind for carrying out the repairs as it's all being done outside, so my attention has been focussing more on researching the practicalities of fishing from it. So far it just doesnt seem like that good an idea and especially not on open lochs in the highlands where the weather and wind can change so dramatically. I am now looking at a self build canoe that I can customise to suit my needs better, the kayak will still be restored but used for paddling about with the kids. What I am after is a canoe that is reasonably stable while kneeling and casting, light enough for me to carry to the water on my own and with enough room to carry a small rucksack with food , waterproofs etc. I am not intending on it being used with other people in it. Any suggestions folks? So far I have been looking at the Peasemarsh 10 kit from Stanley small craft. I'm sorry I can't help you, but wish you the best in your endeavour. Currently N. Somerset. Oftimes Quebec Province, Canada. Learning to cast a fly whilst sitting increases the options. I am still getting used to it, but a Selway Fisher little Kate is light, manouverable albeit a bit tippy on first meeting and needs some sort of seat to avoid a wet bum! If weight is no problem, the widest, flattest barge available is the answer. If you want to go down that route, I have a Riber you can have for not very much! The grandkids can almost stand on the gunwales of that one! Most of the lochs I tend to fish have very easy access to the waters edge but are generally miles away from anywhere as I like the peace and quiet. Too many lochs up here being trashed by the lunatics. And thank you for the offer, I just might take you up on it. If I can figure logistics out of course. I will send you a pm to discuss if that is ok? Take a look at "Fuselage Frame Boats" by S. Jeff Horton - this is a pretty comprehensive manual for the construction of Skin On Frame kayaks and canoes. All the details needed for his "Stonefly" design - a 14' 9" x 29" solo canoe specifically designed for fishing - are included in the book. These are about the lightest and cheapest boats outside of inflatables available. This post may vanish at any moment. I've never fly fished, nor fished from a canoe, but I would think stability is an important consideration so have a good look around - there are lot of boat kits and plans available and they vary a lot in their stability. DougR's suggestion is very good, not only is it a very light construction, but the boat is designed for fly fishing so should have suitable characteristics. Looking at photos of a build, I can see, as I would have expected, that the bottom is quite flat and fairly full into the bilges, so it carries a lot of width low down at the lightest waterlines making it feel stable with any load despite only being 29" wide. Compare and contrast with the Peasemarsh 14 you are considering, and the 3-plank ply construction means the bilge area is quite a wide roughly 45 degree slope so the width at light waterlines is a lot less than higher up - in fact although the top plank (sheerstrake) has tumblehome, the maximum width is still well above the waterline with 1 person in (from the photos on the Stanley craft website). It is hard to see how flat the bottom region is, possibly more of a V shape than the Stonefly, again making the boat, although relatively wide and stable, probably more twitchy feeling than the Stonefly. It is of course impossible to judge accurately from a few photos! If you prefer to work in ply rather than skin on frame, have a look at other designers, personally I suspect that something like Selway Fisher's 14' Peterborough which has 7 planks per side giving a fuller bilge than the Peasemarsh, might be a better option - it is wider than Stonefly and has a more similar shape. SF don't sell kits, but I think can help with getting plywood pre-cut by others if you want to avoid the stages of laying out the plans and cutting the ply. Also consider your operating environment - remote lochs, often exposed and windy. The complete landlubber will probably not realise how big the waves can get on these lochs, the slightly initiated (or someone who already fishes from boats) who know about the waves might well be thinking that the requirement is for a boat with plenty of freeboard (high sides) to stop the waves coming in. Frankly, if conditions are getting that rough you want to be heading for the shore anyway, but there are plenty of times when it isn't rough but there is enough breeze to affect the steering of a canoe (because it takes virtually no wind to starrt affecting the steering! ), and a boat with a lot of freeboard will catch the wind more than one with low freeboard, and end up being more difficult to steer and paddle where you want to go. One of the reasons I homed in on the Peterborough design is that a traditional Peterborough style canoe is a lake canoe and has relatively low freeboard with just a bit of sheer in the ends to ride over waves when head on, and also has relatively little rocker (longitudinal curve of the keel) meaning it tracks well on open water where a more highly rockered boat turns more easily but can be difficult to paddle straight, especially if the wind gets up. Not surprisingly the stonefly appears to be designed with similar considerations having little rocker, relatively low freeboard and absolutely no upturns at the ends to catch the wind. I also suspect that since your main goal is to go fishing, you are not intending to spend 100's of hours learning to handle a more manouvrable canoe, so something that naturally tracks well will cut down the amount of non-fishing learning time you need, or at least, cut down the number of circles you go around in trying to get to your fishing spot thus maximising fishing time! I have just compared 3 designs based on photos, there are many more out there and many more designers and places that can cut plywood from plans if the designer doesn't supply kits. 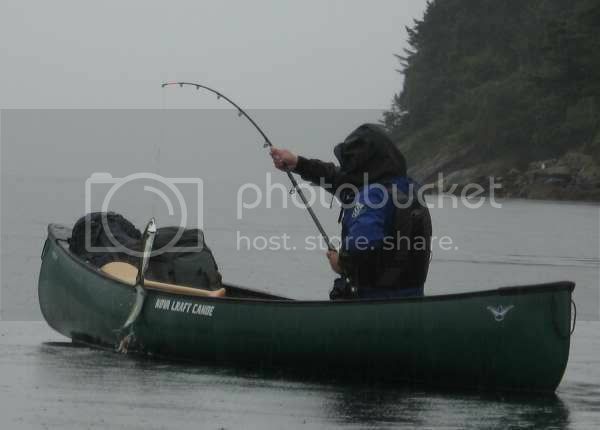 I think the choice of canoe depends on the type of fly fishing you intend doing. I assume lakes and reservoirs, otherwise you could just use the canoe to get to where you want to fish and then either wade or fish from the bank. I only fish dries, in the margins and/or in shallow water, so the latter is what I'd do. If I was fishing lakes and reservoirs I'd hire or buy a clinker rowing boat... YMMV, as they say. I'm at that difficult age... somewhere between birth and death. If I was fishing lakes and reservoirs I'd hire or buy a clinker rowing boat... YMMV, as they say. Yup, that's fine on lakes and lochs where there is a fishery with boats to hire or road access to launch your own heavy clinker boat. Although I've never fly-fished myself, for several years I worked with a draughtsman who was passionate about fishing remote highland lochs such as the OP describes and he often talked about getting hold of a lightweight kevlar canoe that he could hike into some of the bigger lochs with, where there are no fisheries, and no roads. He spent a fair few years in Newfoundland in the past and had fished from lightweight canoes there so had a pretty good idea what he was looking for - such boats are pretty rare in the UK though and he wasn't enough into the idea to import one. For the majority of fishing you're probably better off looking at a float tube and not a canoe tbh. I've fished (fly) from my Grumman and, while definitely stable enough (I've stood up in it to take photos at the top of the river Crake with my two kids in the bow seat) the thwarts get in the way of just about everything, because it's long and narrow the bit of gear you need next is always at the other end of the canoe, it's a devil to fish over the bow drifting with the wind with a drogue at the back and if you use a pair of drogues to drift side on in anything barely more than flat calm then be prepared to ship a lot of water over the gunwale nearest the wind. Using it to get to a spot and then anchoring up to fish from is fine, but you need a pair of anchors or it weather vanes like mad with the barest breeze. One of my best fishing memories was a day spent on the loch which hides itself to the north west of Stac Polly - The trek in is a pretty substantial walk over a pass at about a thousand feet on fairly rough ground. I can nearly imagine doing this with a 20lb canoe - but not with a 25kg boat - a clinker built 19ft rowboat is unthinkable - unless you own a heavy lift helicopter. ... a clinker built 19ft rowboat is unthinkable - unless you own a heavy lift helicopter. C'mon... a solo fly fisherman doesn't need a 19ft clinker boat and not all clinker boats are 'clinker-built' - a 10ft glass one (short and wide) will do better than any canoe. OP (Joe?) said access to the waters he fishes is easy, so there's no reason for not using the right boat for the job, as fishermen have done for centuries... other than if a trailer and launch trolley are totally out of the question. Obviously, if car-topping is essential, then buy something light, but it'll be a less suitable platform for fly fishing. Using a canoe (long and narrow) for fly fishing is a nice idea, but I wouldn't want to compromise my fly fishing with an unsuitable platform. I'd not want to be on a Loch in something that size. Nowhere in the original post is ease of access mentioned. A great many of the lochs and lochans of the far north require a significant approach march and are a real delight to fish, even when a four ounce fish is a good one and a half pounder a monster. I have a tenner for the charity of your choice to anyone who lugs a clinker rowing boat across the shoulder of stac Polly to the loch mentioned above. SA rules, no pictures - it didn't happen. I assume you didn't read OPs second post... . Anyway, regardless of ease of access, a canoe isn't the right choice of platform to fly fish from, but I'll match your tenner if you can think of one that's about 4ft 6" wide. I did spot that eventually, BUT, I'm still not sure if he meant the lochs are roadside, or simply that when he gets to them it is possible to find beaches or similar easy access points? Well, seems we're second-guessing among ourselves - no posts from OP since 5th of Jan. My guess is he's busy building himself a clinker rowing boat - sensible chap.